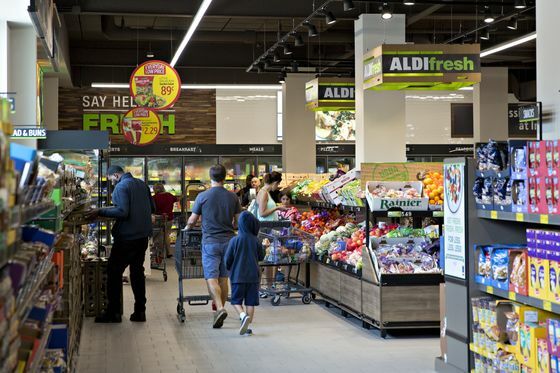 (Bloomberg) -- Aldi is the latest supermarket chain to announce a sustainability push -- an effort the company says will help it trim costs and stand out in a crowded field. Aldi has always charged shoppers for bags -- which encourages consumers to bring their own. Their use is coming under fire across the U.S. as plastic waste fills the world’s waterways. New York lawmakers recently approved a ban on single-use plastic bags, forcing residents to pay for paper ones or re-use their own during store visits. As consumer awareness grows, more restaurants and retailers have come out with plans to curtail the use of plastics and use more eco-friendly materials. Companies are also grappling with rising demand for grocery delivery -- a complex and expensive endeavor. Aldi’s deliveries, which are carried out via a partnership with Instacart Inc., are performing above company forecasts, Hart said. The next challenge, he added, is cutting waste on those orders.